This may well be old hat for many readers, but I've often been on the lookout for a standalone programmable USB transport control. Of course there are a myriad of controllers out there, these days I use a Korg Nano Control Studio when I need physical faders to tweak a mix on the fly (which I often don't). Anyway, I've just discovered the X-Keys range of programmable controllers: http://xkeys.com/xkeys.php, and bought the X-keys® XK-24 USB Keypad. After just a few days, I'm suitably impressed. Now I'm well aware that all this can be programmed using a standard keyboard, but I'm rather taken with having all my common key strokes in one place. When tracking or editing, I can now pretty much do away with my standard keyboard and rely on this nice tactile surface instead. You can programme it to illuminate the buttons (I have play/record illuminate red when recording). Works fine with a Mac and is compatible with Windows, Linux. What neat gadgets! Worth bookmarking because you never know when they'll come in handy. Bob Bickerton wrote: This may well be old hat for many readers, but I've often been on the lookout for a standalone programmable USB transport control. It's a good solution. I used to use a similar little X-Keys device for transport controls and did consider one of their larger devices. I never managed to develop sufficient familiarity with my X-Keys, and I eventually found a solution more suited to my needs in a Frontier AlphaTrack. Good devices though - I've found them especially helpful when you need to set up simple press-button systems for non-technicians. Now that's a bit more like it Alba, especially for £59.99! As I went Amazooming around this one appealed to me. Every button its own LCD display. The software not only customises the buttons it customise their appearance too. Yes, that looks pretty cool. Whilst it's largely designed for bespoke streaming software, the keys can be programmed as hot keys too. That would be perfect for my live rig! Great find, mate! From another fan and long time user of x-keys and products from PI-Engineering, I find it worth mentioning that x-keys comes in different sizes. - buttons can be rotated. You can orient the controller as it pleases you. These products are originally intended for professional CAD/CAM etc. and industrial use. They are build to last, unlike some of the other products I have tried. In other words: if your device works with a normal USB keyboard, x-keys will also work. This reply may look like an ad, but I am just a fan and in no way affiliated or associated with x-keys or their resellers. ConcertinaChap wrote: As I went Amazooming around this one appealed to me. Every button its own LCD display. The software not only customises the buttons it customise their appearance too. Owe you a drink for this one, mate. Ideal as a stage controller for Cantabile. Good move. 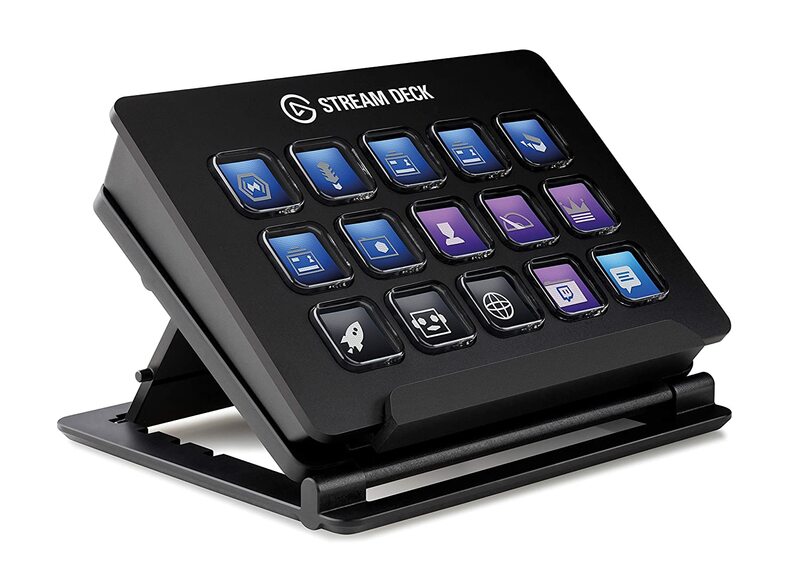 A lot of the information about the Stream Deck is very off-putting, since it seems to assume that we all want to play video games, stream our efforts to the world, video the top of our head and chat as we do it. There's not a lot of information out there that doesn't assume this! Once you get past all that nonsense this is a really good generic control interface, especially for stage work. That was the impression I got from reading the manual. Can't afford it right now having spent all my spare bucks on a new machine but well up my list of things to get. I'm a sucker for things that look that cool. ConcertinaChap wrote: I'm a sucker for things that look that cool. +1 especially if they come close to doing what the marketing dept says they can! I did get a Behringer FC1010, but that was sort of over egging the pudding, too big. I'll get there. Another gizmo I use is a PC remote, the ones with the bigger keys, I can be standing 20 foot away from the PC, recording a voice take at the mic, and I have a fully functioning transport with UNDO/PLAY/STOP/RECORD/PAL/FF/RW/DELETE/LEFT LOC/RIGHT LOC etc in the palm of my hand and the thing only cost a fiver! How easy is it to set up a Stream Deck Mini to control Reaper transport functions, and, maybe record arm for a limited number of tracks?